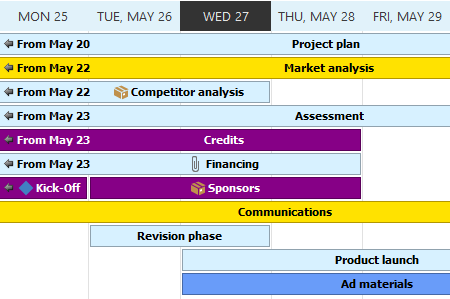 The Global Calendar displays planning elements (summary activities, activities, milestones and published planning elements) across projects in a combined calendar view. You find the Calendar on the InLoox PM tab in the Views group. NOTE Users need to have reading permissions (Read project and Read planning) to be able to see the regarding items in the calendar view. If they don’t have the necessary permissions, the items won’t be visible in the calendar. On the Home tab, in the Global Calendar, there are five different time spans available (day, work week, week, month and timeline). Besides that, you can adjust the zoom levels on the Home tab in the Details group and open today’s calendar. Click on the button Show time of day in the Ribbon on the Home tab in the Current View group to see the exact-to-the-minute start dates and deadlines for each planning element in the calendar. To see those planning elements that take place in your projects at a certain date click on the Select date button in the Ribbon on the Home tab in the Current view group. When you hover over a planning element with your cursor, you see a tooltip. It shows at a glance the name of the planning element, its start, end, location, the regarding project and the name of the project manager in charge of the project which will be displayed as a hyperlink. If you click onto that link, you get all the contact information on the project manager. NOTE The tooltip shows the location that is indicated when creating an activity or a milestone – it does not correspond to rooms in Outlook Exchange. NOTE Working and non-working times in the global calendar depend on the settings you made in the Outlook options in the calendar area. To gain a better overview, you can filter the calendar by the most important planning, project and custom information, e.g. by certain projects or by milestones only. Click on the button Filter on the Home tab in the Current Views group. 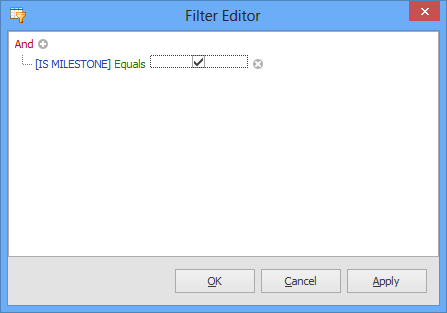 The Filter Editor window opens. Now you can select different criteria (e.g. project name, activity, critical and many more), different conditions (equals, is greater than, is less than and many more) and different relational operators (and, or, not or etc.) and confirm your selection by clicking OK.
You will now see the filtered calendar view. An active filter is displayed below the calendar. To reset the filter click onto the cross beside the filter. If you only want to view milestones in your calendar, please open the filter. Select “Is milestone” as criterion, “equals” as condition and activate the checkbox. When you confirm your selection by clicking OK, you will only see the milestones from your projects in the Global Calendar. Conditional formatting enables you to highlight certain planning elements in the calendar view according to custom rules – e.g. to keep an eye on critical activities. Click on Conditional Formatting in the Ribbon on the Home tab in the Current View group, then select Add Simple Formatting. A side panel opens where you can edit the conditional formatting. Select “Critical” in the Column section and “equals” as a condition. Activate the checkbox in the value section. Now you can choose a color to highlight critical elements. In the example, we chose red. Now, all critical planning elements in the calendar are highlighted in red. NOTE The color that you select in the conditional formatting section overwrites the color of the element in the Gantt chart. You can save the settings that you made in the Details, Arrange and Current View sections in the global calendar as a view, so that you don’t have to make the settings again at a later point. Adjust the view according to your needs. Then click on the Save button in the Ribbon on the Home tab in the Current View group. 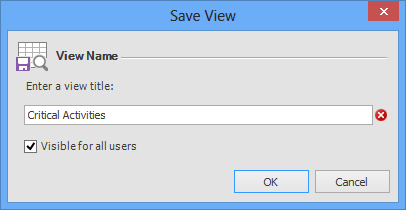 The Save View window opens. Now you can choose whether you want the view to be visible only for yourself or for all users. 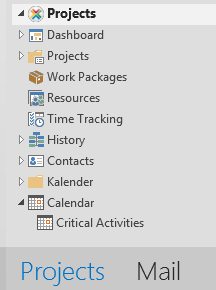 You can open the saved view by opening the Projects section in the Microsoft Outlook navigation menu. It opens a side panel on the left hand side where you can expand the Calendar section. There you’ll find all saved calendar views. NOTE Wenn die InLoox Kalenderansicht erneut aufgerufen wird, wird die zuletzt vom Nutzer geöffnete Ansicht angezeigt. To edit a planning element in the calendar view, you can either double-click on it or click on the Show Details button in the Ribbon on the Home tab. This is only possible if you have the necessary permissions (at least Read project and Write planning). NOTE It is not possible to edit planning elements directly in the calendar. The regarding project opens and the planning element that you chose is pre-selected. Now, you can edit it directly in the project. Mark the regarding planning element in the calendar. In the Ribbon, click on Synchronize on the Home tab in the Actions group and choose whether you want to synchronize the element with your Outlook calendar or your Outlook tasks. After synchronizing it, you will find the element as a calendar appointment in your Outlook calendar or as a task in your Outlook tasks. Calendar | InLoox 9 for Outlook • Copyright 1999-2019 © InLoox, Inc. All rights reserved.